The BBC's FA Cup coverage is starting earlier than ever this weekend - and we want fans to be right at the heart of the action. The BBC Sport website and app will have a rolling live page including goals, updates and the best of social media from all of the 30 matches in the fourth and final qualifying round, starting at 12.30pm on Saturday. Fans can get involved in the coverage by sharing their match-day pictures from around the grounds on social media using #MobileMOTD. On Sunday, fans will get a behind-the-scenes look at the Altrincham v Chester match in our new feature, Mobile Match of the Day. Filmed using only a mobile phone and presented by Radio 1Xtra's Nick Bright, Mobile Match of the Day will give a unique insight into the dressing rooms, the match action and the fans' stories. The BBC will then bring you all the best live action, highlights and analysis all the way to Wembley. Just like last season, the FA Cup draw will travel around the country, with Monday's first-round draw taking place live from Thackley Juniors Football Club in Bradford. 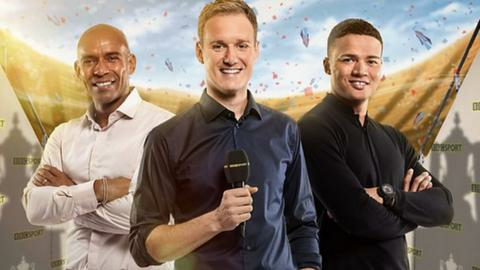 The first-round action kicks off on Friday, 6 November with live coverage from one of the most anticipated ties on BBC Two at 19:30 GMT, presented by Dan Walker along with Trevor Sinclair and Jermaine Jenas. You can find out which non-league teams will be involved in the first round by following the action from Saturday's fourth qualifying round games via updates on BBC One's Final Score, as well as coverage on our Match of the Day live page, showcasing the best of all the action on the BBC Sport website and smartphone app. And there will be BBC local radio online commentaries for many of this weekend's ties. The Match of the Day live page will provide a live scores service featuring fans' pictures from the games across the country, and the BBC Sport and Match of the Day social media accounts will engage in audience debate and discussion as lower league clubs strive to make it into the first round proper. Mark Cole, lead executive for BBC football, said: "It is going to be another exciting year of FA Cup coverage across the BBC and we're delighted to give extra prominence to the fourth qualifying round of the competition to start things off. "Over 36 million watched our coverage last season, nine million more than the previous season, which shows the competition is in rude health and we look forward to another year of comprehensive coverage across the BBC." There is a crucial weekend of action for clubs competing in the FA Cup this weekend - with victorious sides through to the first round proper. We will have a live text pulling together some of the crucial action on Saturday - and there are also numerous commentaries from local BBC stations.